This two part course begins with the eight week study of the Buddha’s teachings on karma and the conditional nature of experience. In part two we continue and deepen our study of conditionality through the study of the Buddha’s profound teaching on dependent origination. In this teaching, the Buddha offers insight into the cyclical unfolding of our experience of suffering and how it is possible to realize freedom from these cycles of stress and suffering. After reviewing the teachings on karma from the Fall course we will study the Buddha’s teachings on the conditional and impersonal nature of experience by looking at the Buddha’s profound teaching on dependent origination. In this teaching, the Buddha offers his insight into the cyclical unfolding of our experience of suffering and how one can realize freedom from the cycle. The following book and the Companion pdf text that accompanies the book would be great for folks who wish to dig deeper into this topic: Under the Bodhi Tree: Buddha’s Original Vision of Dependent Co-arising Ajahn Buddhadasa. And, Companion to Under the Bodhi Tree: readings on pa?iccasamupp?da from P?li suttas. Mary Clark has arranged for Moon Palace Books https://www.moonpalacebooks.com (a locally-owned bookseller in the neighborhood) to offer the book for us at a 20% discount, just let them know that you are taking the class at Common Ground. The proliferation of thinking, known as papanca, is rooted in perception. Thoughts born from self-concern then assail us, re-creating the sense of “I,” which leads to suffering. The five aggregates are a way to describe our human experience without relying on a sense of self, or “I.” A discourse from the Buddha shows how we create the sense of “I” over and over by laying claim to the aggregates, and how to see experience free of the sense of self. This talk explores the creation of a sense of self through the chain of dependent origination. By not responding to feeling tone with craving, we avoid clinging and becoming a new “I.” Then we can discover a state of “unentangled knowing” and find a sense of freedom here and now. Volitional actions, known as karma, arise in ongoing patterns that seem to provide a sense of continuity of the individual, even after death into rebirth. When we understand how the results of actions take place, we can use the law of karma to shape our lives in the direction of happiness. Repetitive patterns of thinking, feeling and acting are instances of karma which can be undone by using the tools of dharma practice. 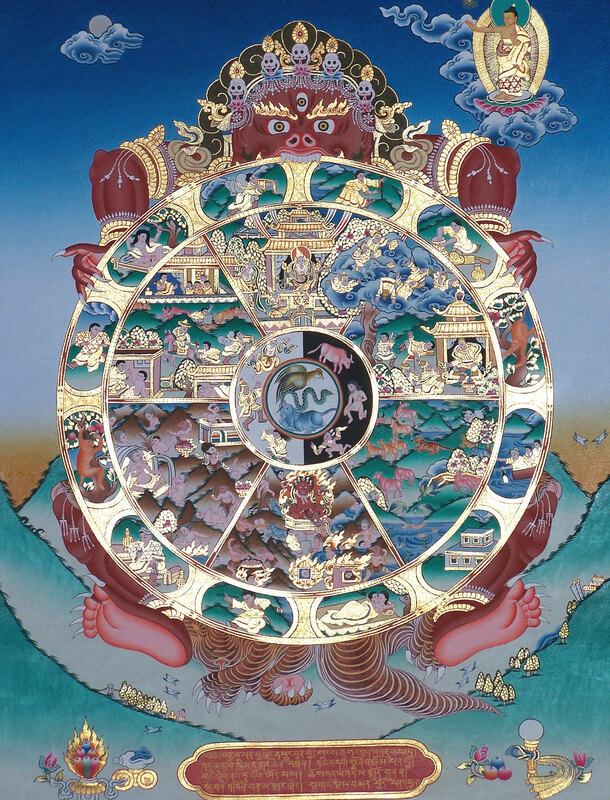 Following the Eightfold Path, one can awaken and reach the complete end of karma. This powerful teaching form the Upanisa Sutta shows us how suffering when understood with wisdom leads to faith and is the beginning of a natural unfolding of beautiful qualities of the heart which provide the foundation for the mind to turn to awakening. Thanissaro Bhikku has a ten part series of talks at the webpage on Dependent Origination that you can download or stream. Scroll down until you find the talks on dependent co-arising.